Turkish President Recep Tayyip Erdogan says prominent Turkish journalist Can Dundar, who is in exile in Germany, is a convicted spy and should be extradited to Turkey. Erdogan told reporters Friday: “At this moment this person is, according to Turkish law, a convict, a spy (who has) revealed state secrets.” He was speaking at a joint news conference with German Chancellor Angela Merkel. Dundar was convicted in 2016 of revealing state secrets after his newspaper published photographs suggesting that Turkey’s intelligence agency was involved in sending weapons to Syrian rebels, and fled for Germany that year. Merkel said it was “no secret” that Turkey and Germany differed in the case of Dundar, and stressed that there was no pressure put on him not to attend the press conference. Earlier, Dundar said he would not attend the press conference after learning that Erdogan was considering canceling it if he were there. German Chancellor Angela Merkel says she hopes to get together with the leaders of Turkey, Russia and France next month to discuss the situation in Syria. Merkel said she talked about the situation in Syria’s last rebel-run region, Idlib, with Turkish President Recep Tayyip Erdogan on Friday. The idea has previously been floated by Turkey. Turkish President Recep Tayyip Erdogan says Turkey expects closer cooperation from Germany against “terror” groups, including Kurdish rebels and people with alleged links to a failed 2016 coup in Turkey. Speaking during a joint news conference with German Chancellor Angela Merkel on Friday, Erdogan said thousands of Kurdish militants and hundreds of people with alleged links to U.S.-based Muslim cleric Fethullah Gulen are living in Germany. Turkey accuses Gulen of orchestrating the coup. Erdogan also called on Germany to show respect to Turkey’s judicial system, in reference to German criticism of arrests in Turkey of German citizens on terror-related charges. German Chancellor Angela Merkel is pressing Turkish President Recep Tayyip Erdogan for the release of Germans still detained in Turkey in the wake of a crackdown following the country’s 2016 coup attempt. The detentions have been one of the deepest irritants to German-Turkish relations recently. Germany says 35 Germans in total were imprisoned on what it considers political grounds. The most prominent have been released, but five remain in Turkish custody. An exiled Turkish journalist says he won’t attend a press conference in Germany with Chancellor Angela Merkel and Turkish President Recep Tayyip Erdogan after learning the Turkish leader was considering canceling if he were there. Can Dundar, the former editor of Turkey’s opposition Cumhuriyet newspaper, said Friday in a video message on Twitter that he believed German journalists would ask questions on his behalf. Erdogan, who says Dundar is a terrorist, is on a three-day visit to Germany. 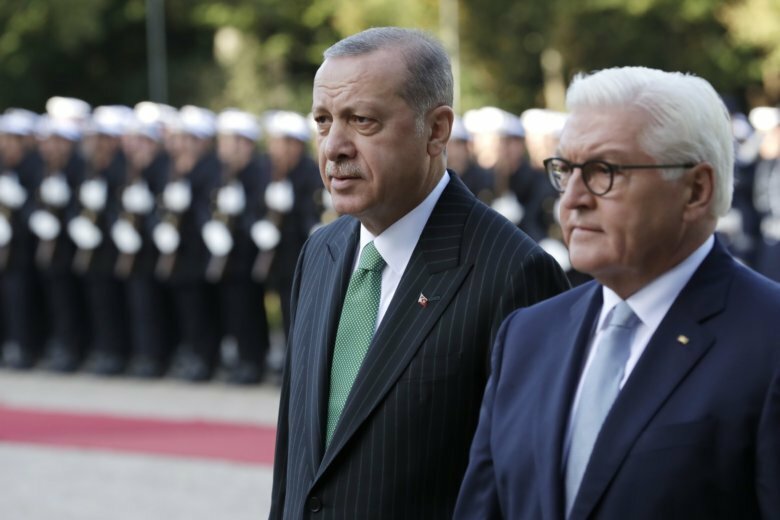 Germany’s president is entering talks with Turkish President Recep Tayyip Erdogan with the hope that the state visit leads to a thaw in relations between the two NATO allies. The two countries are strategically critical to one another, with Turkey looking to Germany and the European Union for help with its economic woes, and the EU counting on Ankara to reduce the flow of migrants to Europe. But they’ve clashed over numerous issues to the point where Erdogan accused German officials of acting like Nazis, prompting Chancellor Angela Merkel to condemn the Turkish president’s words. The item timed at 12:40 p.m. has been corrected to say that Dundar said he ‘believed’ journalists would ask questions for him, not that they had assured him.